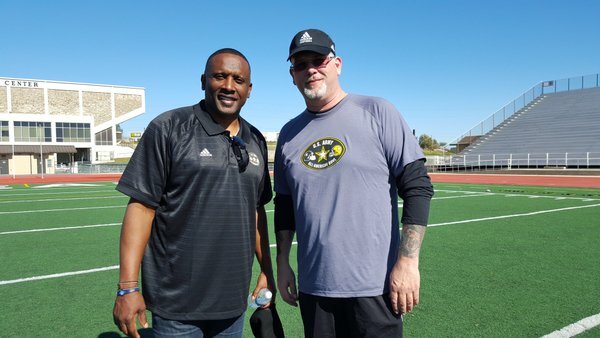 Doss Head Coach, Phil Hawkins (right), with NFL great Tim Brown. Twitter. 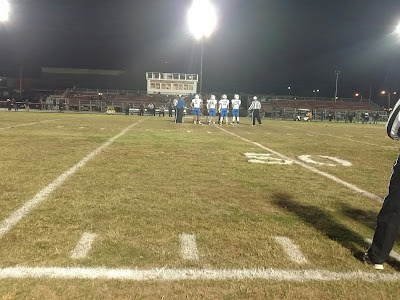 The Highland Bluebirds traveled to Louisville, Kentucky in the KHSAA playoffs on Friday night with a 3-7 record. The Bluebirds, having a down year, lost 52-32 to Louisville Doss and were bounced out of the first round of playoffs for the first time since 1991. But according to Louisville Doss Head Coach, Phil Hawkins, the Bluebirds' final record isn't the only thing that people should look to when they measure the amount of success the team had. After pages of commentary on the quality of play on the field on the high school message board forum, Bluegrass Preps, Hawkins stepped in to compliment the quality of the Highlands Bluebirds' character. "I have read most of this thread and I am surprised by what I read. As a coach, I can say that as leaders of these young men, we get to watch these young men grow up in front of our eyes, learn to be a part of a team, struggle together and enjoy the game of football for the few short years we get to be with them. We all have different pressures, whether it is winning 10 games, as it seems for HHS or wondering where the next meal is for some of my players. Regardless of what we all think or say or do, there continues to be some pressure. Our kids thought that playing against HHS was an honor and they felt even more privileged to win a game against such a storied program. I can also tell you that HHS kids were amazingly polite, classy and great sportsman. Our kids at Doss have not stopped talking about how "awesome " Highlands was. What we all need to realize is that in this case, at 3-8, HHS football made an impression on the Doss program that has only won 13 playoff games and it wasn't even about who won or lost. If I am a parent, coach or player, heck even a fan, I would be so proud to be a part of the Highlands tradition. As much as the win meant to Doss, the impression the HHS program left on our kids was priceless." While the first round playoff game was played at Doss' home field, the stands were almost empty. Allen Ramsey, FTM's photographer is DWC Photo (Dad with a Camera). He travels to almost every home and away sporting event the school has. He said that he was a little disheartened to see that the home team only had about 30 people in the stands, but was uplifted by Hawkins' comments. "It's pretty awesome that he took the time to say that. It must have made a pretty significant impact for him to come out and make a point to strangers about how polite and respectful the team was," said Ramsey. "I think it's great that some of some of our parents are going out of their way to support their team that appears to not have same support or structure that (Highlands) has." Louisville Doss will travel to Park Hills to take on the Covington Catholic Colonels on Friday night at 7:30 p.m. The event Facebook page can be found here. HHS at Doss. Photo: Tracy Coffman.